Historians agree that the first people entered the Western Hemisphere by way of the Bering Strait. They also agree that this occurred during the Ice Age or Pleistocene. Estimates of their arrival range from 20,000 BC to 15,000 BC. Most of these early people made their ways to ice free areas in Mexico, Texas, Arizona, and New Mexico. Largely, they lived in caves and under rock outcroppings, and they survived by foraging for wild plants, and hunting wild game. These early people traveled in small groups to wherever there was food. Sometimes the food sources were not available because of drought, and other times there were bumper crops because there was so much rain. 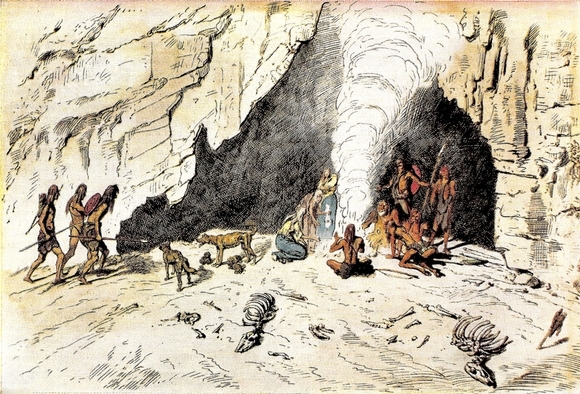 Cave dwellings had at least one storage pit and a shallow hearth near the center of the cave. Both the men and women had their own work areas for things like butchering meats and preparing meals. Sleeping areas were covered in oak leaves so they could sleep in comfort. These early people knew how to roast plants in earthen ovens. Yucca was very popular, and it was cooked for one to three days before it was edible. Other favorite plant foods included wild fruit, wild onions, tulle roots, pine nuts, agave, acorns, and sotol. Other popular foods include the prickly pear cactus, and the mesquite plant which supplied flour as well as a popular sweet syrup. The first Americans hunted with spears, clubs, and a spear-thrower called an atlatl. Mostly, these weapons were equipped with a sharp obsidian tip. The bow and arrow had not been developed at this time. These people hunted in micro-bands of 4 or 5 people. However, they probably belonged to a much larger community that was made up of no more than 25 people. The larger group only assembled when there was an abundant harvest. Butchered Pleistocene elephants and horses have been discovered at ancient archaeological excavations. However, both of these disappeared by the end of the Ice Age. These first people also hunted, rabbits, antelope, gophers, fox, squirrels, skunks, rats, deer, reptiles, birds, and insects. Antelope and rabbits were hunted communally by groups of people who beat the weeds as they moved across the open plain. After the rabbits and antelope were forced into a box canyon, they were clubbed to death. Afterward they were skinned, butchered, and dried for consumption. Much of the meat was roasted over an open flame. Antelope herds usually contained between 50 and 100 animals. They hunted antelope in much the same way as the rabbits, However, antelope did not appear as frequently as rabbits. Over the years the first Americans learned how to adapt to their environment. They knew that they couldn't rely on rainfall. Before long, they developed nets, snares, bow drills for making fires, baskets, and crude ceramics. Eventually, the Native Americans began to cultivate crops. The first plant that was domesticated was the bottle gourd. The bottle gourd was used as a container for carrying water, and it is said that most Archaic foragers traveled with bottle gourd seeds. Before long people began planting wild beans, squash, and tomatoes next to the bottle gourds. However, none of these would become as important as the wild grass �teosinte� which was the ancestor of corn.